As part of Yeats 2015, an exhibition called Dance like a Wave of the Sea/舞 动 波 涛 will run on the Shanghai metro from 31 October to 18 December. The exhibition, whose title takes inspiration from Yeats’ poemThe Fiddler at Dooney, features quotes in Chinese and English from six of Yeats’s best known poems in China, along with information on his life and work. These quotes are displayed on doors, handlebars and poster spaces on all carriages of a dedicated culture train on the Shanghai metro system (Line 10). They are also shown at four locations in two Metro stations. The train carries 10,000 passengers per day and the two metro stations involved see 75,000 passengers each day. A public and media event to profile the Yeats 2015 exhibition on the Metro will be held on Sunday 15 November at the main People’s Square station in downtown Shanghai. 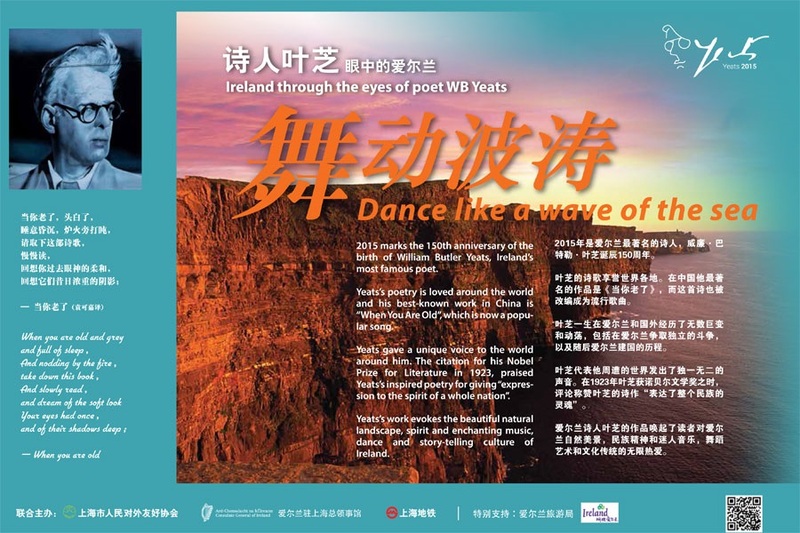 The event will feature Yeats readings, Irish music and dance by local Chinese performers and travel on the Yeats 2015 train to see the station displays. The Director of the Ireland Literature Exchange will participate along with a number of the main Chinese translators of Yeats. The Shanghai Metro are devoting resources to the organisation and funding of this public and press event. Tourism Ireland and the Consulate of Ireland in Shanghai will also profile the exhibition through additional press and social media networks in China. Images and information on the upcoming events are available here.